Deserving of its place in the pantheon of defunct playgrounds, Pacific Ocean Park (POP), active in Los Angeles between 1958-67, not only covered 28 acres of sand and surf on the border of Santa Monica and Venice, it straddled an uneasy line between Disneyesque, World’s Fair-inspired themed entertainment and traditional pier-based carnival fun. It was a brazen balancing act that, while thrilling at first, began to fray quickly as big dreams obscured both financial reality and the cost of maintaining a complicated outdoor business on the water. 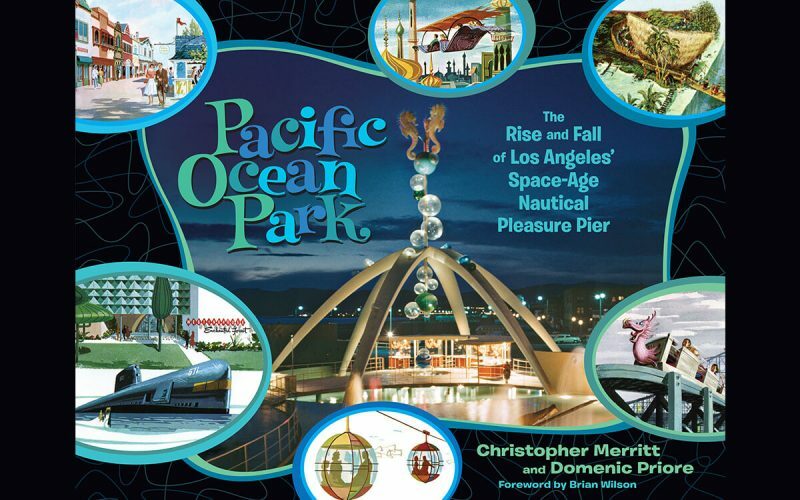 The dazzling birth and slow, rather shocking death of POP are documented vividly with text and vintage images in Pacific Ocean Park: The Rise and Fall of Los Angeles’ Space-Age Nautical Pleasure Pier (Process Media, hardcover, $34.95). Packing 15 years of research and interviews into 264 oversized pages graced with rare color and black-and-white images, authors Christopher Merritt and Domenic Priore trace POP’s early-20th century beginnings as two adjoining amusement parks — the Ocean Park Pier and the Lick Pier, jutting some 900 feet into the bay between the Santa Monica Pier to the north and the popular pleasure docks of Abbot Kinney’s Venice to the south. 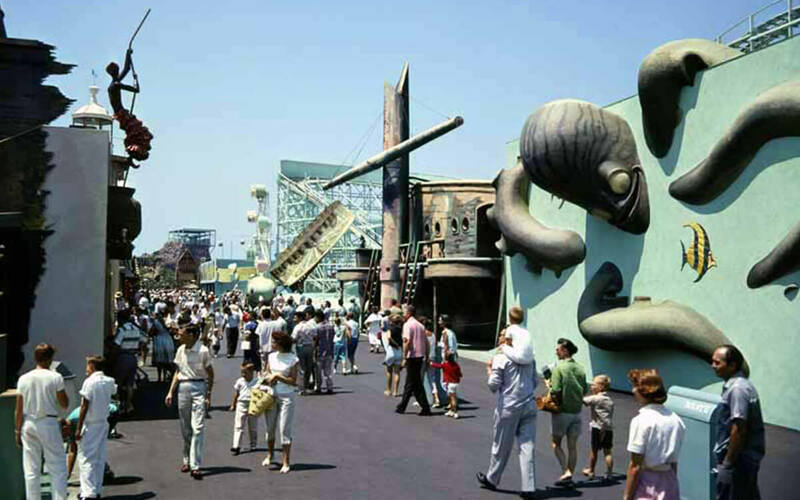 By the mid-1950s, under the joint ownership of the Turf Club (proprietor of Santa Anita Park thoroughbred racetrack) and CBS Television, and spurred by Disneyland’s success, the dual pier complex was transformed from a loose collection of rides and concessions into a more aesthetically cohesive “oceanic wonderland” — complete with a sculptural, 60-foot starfish-shaped entrance adorned with whimsical seahorses and plastic bubbles, all enwrapped in fountains and a towering waterfall-façade. 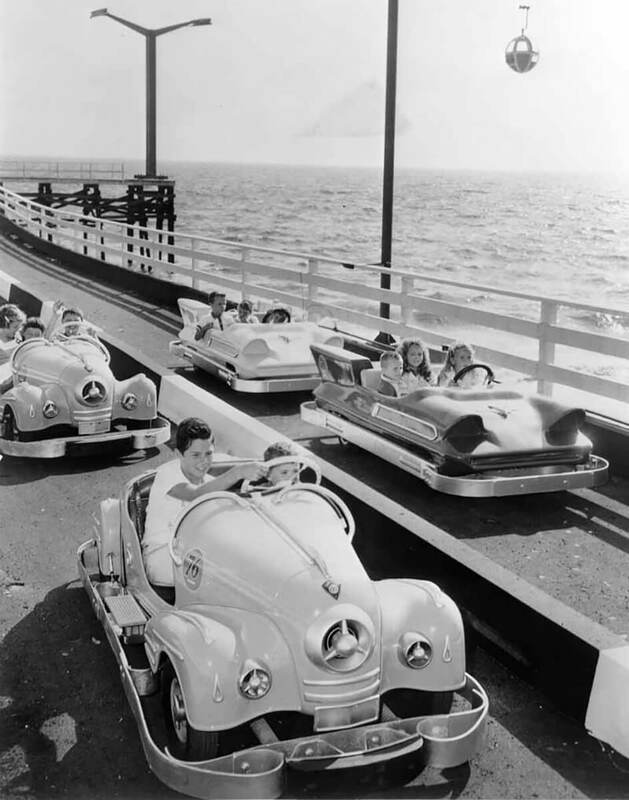 The true roller coaster ride for POP began in the fall of 1959, when mounting debt outpaced the gate and ownership of the enterprise was transferred. At this point in the book, the research heft shifts from co-author Merritt, a theme park designer and historian (he also authored Knott’s Preserved, 2010), to pop culture expert Priore (Riot on Sunset Strip, Pop Surf Culture) and incorporates an overview of the changing youth and live entertainment climate between the beach and the Sunset Strip. The story becomes a riveting account of the political, cultural and urban renewal crosscurrents that — despite bursts of optimism in the form of TV dance shows and movies using POP as a backdrop — conspired to weaken further the pier’s fragile financial and structural underpinnings. POP’s closure in late 1967 marked the beginning of an extended period of decay that saw deck-busting storms, arson-sparked fires and the formation of a territorial, sometimes violent surfing gang that slalomed through the pier’s rotting pilings. There’s no feel-good ending here. The publication of Pacific Ocean Park coincides, fittingly, with another cycle of Venice-area gentrification that has given rise to the moniker “Silicon Beach” — with rich Digital Age companies like Google dropping anchor locally. Some changes have been for the better, but efforts to bring amusements back to parts of the oceanfront have been squashed by fearful landowners and community leaders. As anyone who has built a sandcastle knows, innovating at the tide line isn’t tidy. But recreation for the masses is essential, and down by the sea, America’s carny heart will always beat strongest. This article first appeared in the November 2014, issue of Amusement Today, and is reprinted here courtesy of Amusement Today. For subscription information, visit AmusementToday.com.